If you haven’t followed New Richmond High School Tiger Football in recent years, now may be the time to start! It was clear not far into fall camp that the Tigers would be a great team-centered group. Coaches have continued to emphasize developing a strong core as a team. The core continues to be strengthened and solidified through each hard practice or drill, each challenge the team embraces, and as the team roster has condensed. Team members had the opportunity to participate in a leadership program this past spring. Thirteen of the previous 9th-11th grade football athletes completed the program. Observing the athletes grow and develop into leaders and role models, learn to lead by example, and, ultimately, develop into young adults with leadership abilities is inspiring. 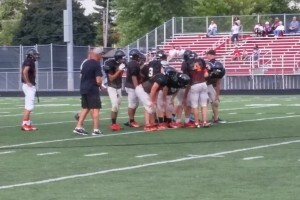 The typical “freshman do the grunt work” philosophy no longer exists amongst the Tigers’ Football team. 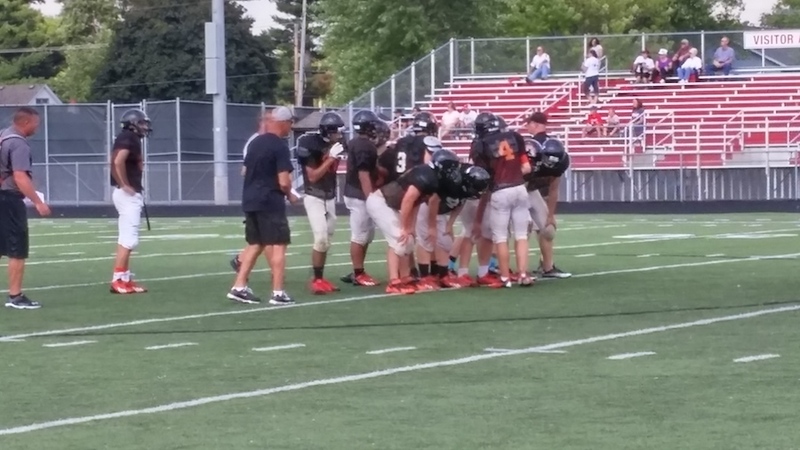 Instead, the upperclassmen lead by example, and everyone works together as a team, from senior to freshman. One of the most encouraging moments was when most of the team had finished running a lap, then went back to finish out a full length of the field with a few team members. If you look closely on their helmets, you will find either “attitude” or “effort”. They are embracing each of these well! The coaches are required to be positive role models and lead by example, as well. Coaches and athletes are held to the same standards. For example, both athletes and coaches have to run a lap around the fields for swearing. There is minimal lap running as we transition into the second season under Coach Keith Badger. Requiring coaches to be strong role models and leaders is really not necessary, however, as all of the coaching staff are positive, encouraging, and interested in helping the athletes grow into young adults who will strengthen the community. Tiger football has become more family-oriented and involved in the community. Last winter, some of the football players and parents spent time working with the city to dig out fire hydrants around the community. Football involvement has expanded beyond the 9-12 grade group as the coaches work closely with the youth programs for a community-based football program. All levels are also teaching the Heads Up Tackling program. And, new this year, parents and athletes are invited to pizza on Fridays after home football games to provide time together when such time can be limited during the busy football season. The Tigers wrapped up their second week of fall camp with a variety of events. 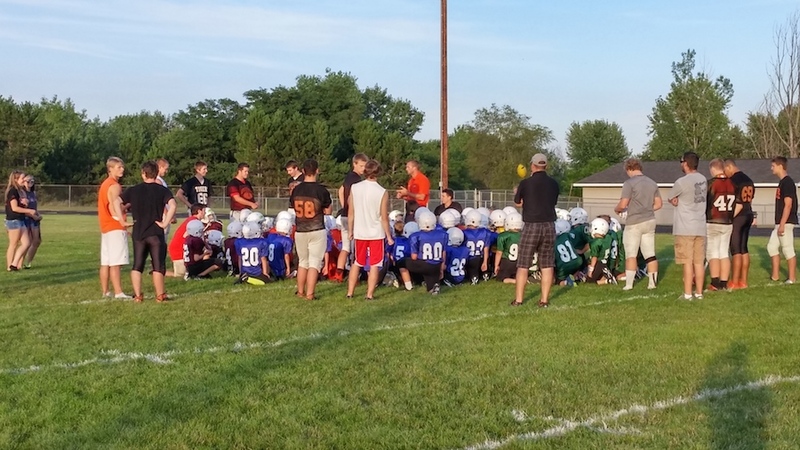 On Wednesday, the youth and high school program worked together for the 2nd annual Community Football Night. 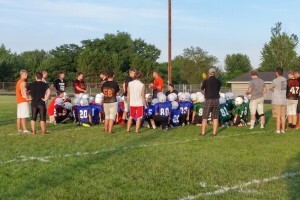 High school players and coaches led stations for the youth teams, followed by intrasquad scrimmages for both the C/JV and Varsity teams. 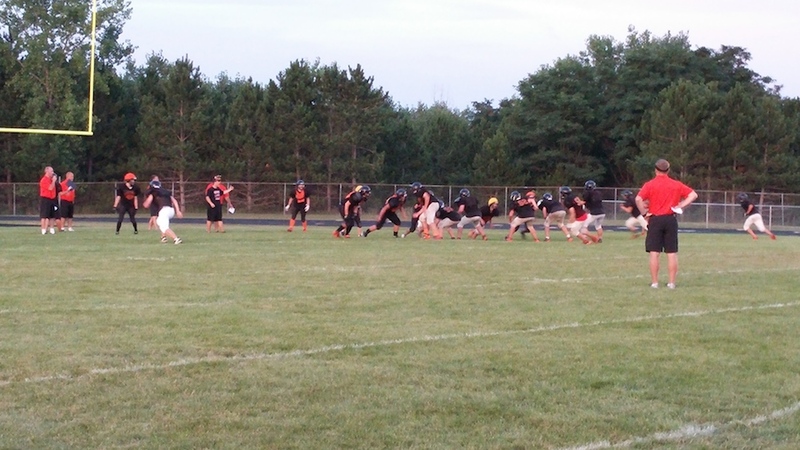 Both JV and Varsity traveled to Chippewa Falls on Friday for scrimmages against Chippewa Falls, Wausau East, and Sparta, and they ended the week with their annual family picnic Saturday afternoon. Please come out to support the hard work the coaches, athletes, and parents have put in this year! Whether they go 8-1 or 1-8 in their game winning record, you are guaranteed to see a team the plays well together, supports each other, and demonstrates effort and attitude in each game. We all look forward to seeing you at the games!